By Tim Royner: Matchroom promoter Eddie Hearn says he has a five-man short list of good heavyweights that he plans on picking from for the July 13th fight for Dillian Whyte (25-1, 18 KOs) on Sky Box Office PPV. However, Hearn says he’s going to wait until the World Boxing Council’s ruling on Whyte’s mandatory status before he makes the decision about his next fight. Hearn maintains that it’ll be a good fighter that Whyte faces on July 13, due to the fight being shown on Sky Box Office. That means the fans will have to pay to see Whyte’s next fight. Will the fans be gleeful about paying to see Whyte fight someone like Dave Allen, Lucas Browne in a rematch, Robert Helenius or Joseph Parker in a rematch? 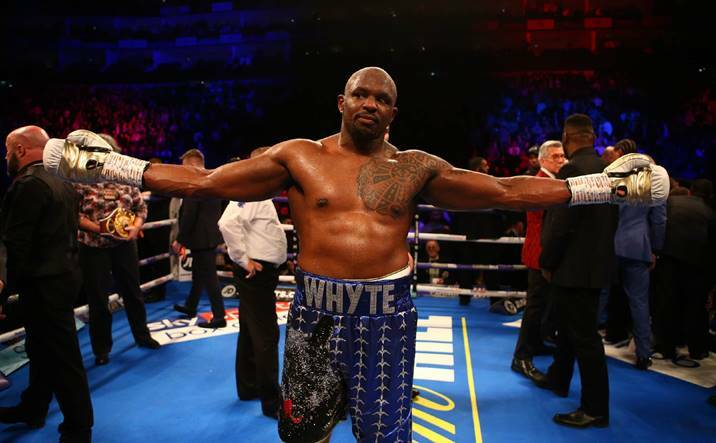 Will the fans want to see Whyte fight the recently knocked out 36-year-old Eric Molina? The casual boxing fans probably won’t be aware that Molina was beaten recently. As long as Hearn lets the fans know that Molina challenged both Joshua and Deontay Wilder for world titles in the past, that’ll likely be enough to keep a lot of them happy. The fans would like to see Whyte fight Joe Joyce or Luis Ortiz. However, Hearn doesn’t want to match Whyte against a good fighter if the WBC gives him his wish by saying the winner of the Wilder-Breazeale has to fight him next. You can argue that the WBC ordering the winner of the Wilder vs. Breazeale fight to face Whyte will work against the British boxing public, as far as Whyte’s next fight on July 13. Hearn says he doesn’t want to match Whyte against someone like Ortiz if the WBC is going to let him fight the Wilder-Breazeale winner. Hearn already spoke to the WBC in requesting that they install Whyte, 30, as the immediate mandatory to fight the winner of the May 18th fight between WBC heavyweight champion Deontay Wilder and Dominic Breazeale. Hearn asked the WBC to not only make Whyte the mandatory challenger to the Wilder-Breazeale winner, but also force the winner to face him immediately without an intervening fight. Hearn’s asking a lot of the WBC, given that Whyte didn’t fight an official eliminator. Hearn just wants Whyte installed as the mandatory based on the #1 ranking, and the victories [Dereck Chisora x 2, Robert Helenius, Ivica Bacurin, David Allen, Joseph Parker, Lucas Browne, Malcolm Tann and Ian Lewison – he’s put together since being stopped by Anthony Joshua in 2015. The WBC is supposed to make their ruling on Whytes’s situation next week. “There are probably about five options for Dillian in July,” Hearn said to skysports.com. “He wants to have a proper fight, even if he’s mandatory for the winner of Wilder-Breazeale. He wants to have a proper fight and that’s Dillian Whyte all over. The names we are looking at are all good fights and like I said, once we get that ruling, we will be pulling the trigger and making that announcement,” Hearn said. Hearn won’t be happy if the WBC elects not to order the Wilder-Breazeale winner to fight Whyte. There’s no reason for the WBC to order the Wilder vs. Breazeale winner to face Whyte. That would be penalizing them for the mistake the sanctioning body made themselves by allowing Breazeale to sit and wait for two years for his mandatory title shot after he earned the spot with his win over Eric Molina in November 2017. The WBC had a lot of time to order Wilder to defend against Breazeale, but they didn’t do it. They installed Whyte as the #1 contender, which means nothing, given that Breazeale was already the mandatory. The WBC wasn’t going to take Breazeale’s mandatory position away from him and give it to Whyte for not reason. It looked bad enough that the WBC recently was planning on ordering Breazeale to fight Whyte for the interim WBC heavyweight title when Wilder was in negotiations to face Tyson Fury in a rematch on May 18. Hearn hasn’t given any hints about who the five names are on the list of “good” heavyweights that he’s got waiting for him to choose from for Whyte’s July 13 fight, but it’s unlikely that you can “good” in the true sense. Luis Ortiz doesn’t appear to be on the list, which isn’t surprising. Hearn makes it clear that he doesn’t want to add anyone too good if the WBC makes Whyte the mandatory for the Wilder vs. Breazeale winner. He’s not going to have Whyte risk the mandatory spot against a talented heavyweight, especially after how close Whyte getting knocked out by Joseph Parker last July. As far as talented heavyweights, you can forget about Whyte fighting any of them on July 13. I mean, what talented fighter would agree to fight Whyte for little money in July? Not many. As such, you can forget about Whyte fighting any of these guys: Tyson Fury, Deontay Wilder, Dominic Breazeale, Adam Kownacki, Kubrat Pulev, OLeksandr Usyk, Michael Hunter, Joe Joyce, Filip Hrgovic, Daniel Dubois, Andy Ruiz, or Hughie Fury. There’s a legion of other heavyweights that Whyte WON’T be fighting on July 13. depending on how far down in the food chain Hearn wants to go in selecting Whyte’s next opponent, he could pick a fighter that’s coming off of a loss, which would look bad, but the British boxing public would still likely purchase the fight. Hearn is keen on matching Whyte against 39-year-old Alexander Povetkin (33-2, 24 KOs) , who is coming off of a seventh round knockout loss to Anthony Joshua last September. However, Povetkin is already scheduled to fight on May 18 against an opponent still to be determined in Chicago. Povetkin won’t be able to jump back into the ring two months later to fight Whyte unless his May 18th fight is a total blowout. – Tomasz Adamek: Casual boxing fans might not realize that Adamek is 42, and was recently knocked out by Jarrell Miller. When Hearn says the opponent for Whyte is going to be a “good” heavyweight and not a “tick-over,” he’s talking about his own subjective interpretation of the fighter. Obviously as a promoter, Hearn is going to deem any fighter he drags into the ring as Whyte’s opponent as a “good” heavyweight. It’s up to the boxing public to make a decision whether they’re good fighters or not. What Hearn SHOULD do is simply pay Luis Ortiz whatever he’s asking for to get him to take the fight with Whyte. Since Ortiz, 40, was the fighter that the WBC wants Whyte to face in a secondary eliminator, which he failed to take, he could make the the sanctioning body happy and prove to the boxing world that he’s not afraid to fight the Cuban southpaw. Right now, a lot of fans think Whyte has been ducking Ortiz for the last two years by choosing to fight other guys like Lucas Browne, Helenius, Joseph Parker, and Malcolm Tann.